I have one brevipilosa plant that is doing the unusual, it is behaving, and growing (fairly) symmetrical. My other brevipilosa (I grow two) has the normal bent petioles so the leaves wrap around the pot, and they are both from the same mother leaf. I love them both. 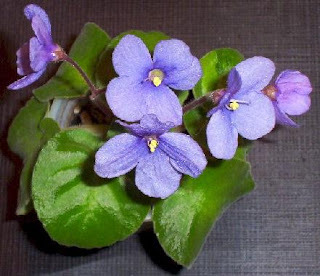 S. brevipilosa is a species violet, which means it grows wild in Africa. I won't go into all the details here, because I already wrote a page about species on my website (visit here). But I did want to share a photo and tell you a little bit about S. brevipilosa. This species is a miniature. 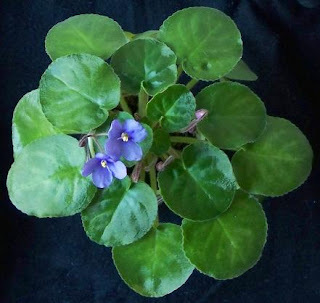 If you thought all species were standard size plants, you might be surprized to learn that several are small. I love brevipilosa's leaves. They are quite large for such a small plant, and round. The leaves are thin, and feel soft to the touch. My plants are almost always in bloom, but since brevipilosa's blooms don't last very long, it might be hard to catch the plant in full bloom. I grow my brevipilosa plants in 3-ounce plastic drinking cups, the little white ones. Since species grow in very little soil in the wild, I try to keep them a bit root bound. I usually wick-water, using a baby food jar as a reservoir. When I look at my brevipilosa plants I think of spring. 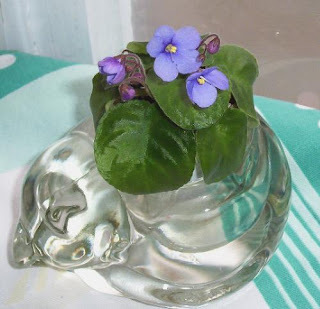 Their lovely leaves and happy blue flowers cheer up any day. Here are some pictures of my S. brevipilosa plants. Please excuse the lop-sided appearance. "Baby" picture, a few years ago. This is a close up of a baby plant growing in a 1-inch medicine cup.